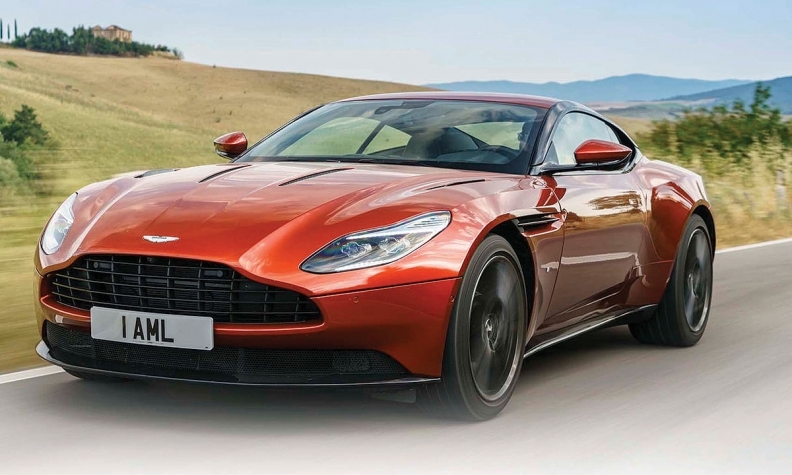 Aston Martin says it has a full order book for 2017 in China for its DB11 coupe. SHANGHAI -- Sales of high-end sports cars from automakers including Ferrari, Aston Martin, Maserati and McLaren are soaring in China, four years after China's President Xi Jinping started cracking down on corruption and conspicuous consumption in the world's No. 1 market. Chinese sales at Ferrari and Aston Martin are approaching their 2013 peaks, following tumbles of as much as 20 percent in 2014, according to data compiled by Bloomberg Intelligence. Maserati, McLaren and Porsche enjoyed their best year ever in 2016. Lamborghini is also on the mend after deliveries plunged by more than half from 2013. "The outlook is looking pretty good for us here in the China market," Reid Bigland, head of Fiat Chrysler Automobiles's Maserati and Alfa Romeo divisions, said in a Bloomberg Television interview at the Shanghai auto show Wednesday. "With us, we just haven't felt it," he said, referring to the impact of the crackdown on consumption. Xi hasn't ended his drive to curb wasteful spending by officials and eliminate graft. Instead, private consumption is filling the void left by extravagant gifts aimed at currying political favor. The number of Chinese millionaires rose 10 percent last year and is expected to more than double to over 1.7 million by 2026, according to research by Johannesburg-based consultancy New World Wealth. Consumer confidence is the highest since the global financial crisis amid a strengthening Chinese economy. Bloomberg Intelligence analyst Steve Man says consumers have become inured to Xi's campaign. "Business owners are coming back into the market to snap up these vehicles," he said. "The improvement is very encouraging for China. It could point to a potential improvement in the entire luxury auto market." A 10 percent "super luxury" tax announced by the Ministry of Finance in December on cars costing more than 1.3 million yuan ($189,000) to "guide reasonable consumption" and cut emissions hasn't damped the lust for the sports vehicles. "Yesterday I received another 60 orders for our Mulsanne extended wheelbase, it's our flagship model, it's the most exclusive and expensive model on the stand," Wolfgang Durheimer, Bentley CEO, said at the Shanghai show. "And obviously, the Chinese customers that still like to be driven really go for this model." Durheimer said he expects to set a new sales record for the Bentayga SUV in China this year. Maserati's sales have surged 119 percent year to date, said Bigland, who is planning to increase the number of outlets for the Maserati and Alfa Romeo brands in China by 50 percent to as many as 75 by the end of the year. McLaren Automotive is expecting to sell 300 cars this year in China, after almost doubling sales to 235 in 2016, as a culture of motor sports starts to develop, sales chief Jolyon Nash said. Ferrari Greater China maintains a pivotal position in the carmaker's global strategy, Ferrari said in a statement. "China is the fastest growing luxury market" and driving global luxury trends, said Andy Palmer, Aston Martin's CEO. The luxury SUV is a market that was "originally driven by the Chinese. That's a perfect example of why China is important." Aston Martin has a full order book for 2017 for its DB11 coupe, said Palmer, who is "pretty confident" the carmaker will hit its target of selling 270 cars this year -- up from 170 in 2016 -- and plans to "stretch the team" to win more orders. It isn't just the super-rich who are buying. At a somewhat lower price, demand for BMWs and Audis is growing as well. Total sales in China's premium-car market may surge to 3 million units per year in about a decade from about 2 million now, Audi chief Rupert Stadler said in Shanghai on Wednesday. The Volkswagen Group nameplate leads the premium segment in the country. Honda Motor Co.'s Acura aims to sell 30,000 vehicles this year, while Hyundai Motor Co. is planning to bring its Genesis luxury brand as early as next year. China "is going to be the largest luxury market within a year or two," Kumar Galhotra, chief of Ford Motor Co.'s Lincoln division, told Bloomberg TV Wednesday. Lincoln entered the country about two years ago. Xi, who took charge from Hu Jintao as China's leader late in 2012, has shown no sign of abandoning his anti-corruption drive, a signature campaign that has struck fear across the government and helped him consolidate more power than anyone since Deng Xiaoping, the nation's "paramount leader." About 415,000 officials were punished in 2016, a 23 percent increase from the previous year, according to government statistics.